Have you ever wondered how long you should brush your teeth, or whether mouthwash should be a regular part of your oral routine? Our dental experts have the answers to your most pressing dental questions! We hope these insights will continue to enrich your life and your oral health for years to come. 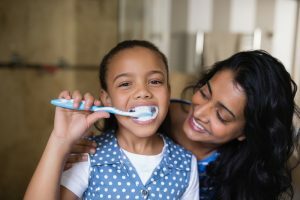 Maybe it’s not your most pressing question, but it’s certainly one that we’ve all wondered about: how long should you brush your teeth to make them clean? In the dental community, the consensus tends to settle at around two minutes. You can divide that two minutes into the four sections of your mouth: top and bottom, left and right sides. 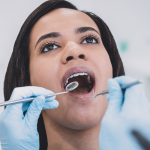 Use a soft-bristled brush, and be sure to replace it every three to four months, or sooner if it begins showing signs of wear.You might also want to know how long should you brush your teeth with braces. The answer is the same: two minutes, but you should be prepared to replace your toothbrush more often because the brackets and wires can take a toll on the bristles! Can you brush your teeth too much? Unfortunately, yes, too much of a good thing can be detrimental in this case. 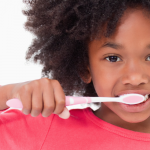 Over-brushing can lead to sensitive teeth and receding gums, especially if you use a hard-bristled brush. Twice or three times a day shouldn’t be a problem for most people, unless you have particularly sensitive gums. If you’re concerned this may be a problem for you, it is best to be personally evaluated by a dentist. Should mouthwash be part of your regular dental routine? Regular mouthwash can prevent tooth decay, but it’s not typically required for your oral regimen. Although the frequency and timing of your rinsing with mouthwash can generally be left to personal preference, the American Dental Association advises users to heed manufacturer’s instructions for use. Depending on the ingredients, some mouthwashes should be used in a specific sequence.If you suspect gum disease, a daily gingival mouthwash can be very effective in cleansing your mouth of the bacteria. If you are going to opt for an over-the-counter mouthwash, be sure to look for the ADA seal of approval. 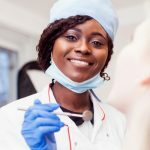 You may be prescribed a mouthwash if your dentist is treating you for gum disease, in which case you absolutely should use it according to your prescription. Why do I get oral sores all the time? You’d be surprised at the sheer number of types of oral sores. One of the most common is the canker sore, which often lasts for up to 14 days. 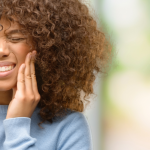 Canker sores could be caused by stress, injuries from brushing or biting the inside of your cheeks, and even vitamin deficiency. You can treat by rinsing with warm salt water and eating bland foods. Cold sores, on the other hand, are caused by the Herpes Simplex virus and may come and go throughout your lifetime. If your sore has become red and inflamed or lasted beyond 14 days, you should see a dentist who works in oral medicine. My gums started bleeding when I was brushing. Do I have gum disease? It’s possible.However, you might just be brushing too hard. Alternatively, your gums are more likely to bleed if you’re taking meds that thin the blood (like aspirin, coenzyme Q10, or Coumadin). Generally speaking, it’s safe to say that regularly bleeding gums indicate that you’re not getting rid of all the bacteria at the gum line. If you’re bleeding even after a week of (gentle) flossing, you should see a dentist before it gets worse. It’s a little-known fact that gum disease is the top cause of lost teeth! Usually, it is.There used to be a concern that whitening could increase your risk for cancer, which studies have shown is not the case. However, some people who have their teeth lightened may experience tooth sensitivity for a short period of time. That’s why it’s recommended to do your whitening in-office, so a specialist can walk you through the process, as well as potential side effects. Whitening can be a great way to improve your personal appearance. Our advice is just not to use tooth-whitening bleaches more often than recommended, and to do whitening with professionals (and not with the over-the-counter kits found at the pharmacy). Learn more about whitening safety in this American Dental Association statement. If you have more questions, we hope you’ll come make an appointment with one of our dentists, who can answer them. Don’t believe everything you see online about dental care! Dentistry is a specialized area and like in the field of health, dental myths abound on the internet. Take the time to educate yourself and your family about proper dental care, and your mouth will surely thank you in the future! To make an appointment at Penn Dental Medicine, please give us a call at 215-898-8965.